The Fraser Island and Great Barrier Reef Holiday Package Tours may be swapped around to suit your preferred tour departure date. The Sunset Safaris Fraser Island 5 Day Eco Tour is designed for all ages, offering an exciting adventure that includes comfortable Quad Share Accommodation, with Twin Share or Luxury Hotel upgrades available. Sunset Safaris is the only company from Gold Coast and Brisbane to Guarantee Luxury forward facing 4WD vehicles, offering superior safety and comfort on this highly informative Eco tour. Depart Island approx 12:30 - 2:30 pm. The Sunset Safaris 5 Day Fraser Island Great Barrier Reef Package tour offers fantastic value, with a 1 Night stay at a Rainbow Beach backpackers, (or motel if in twin share) and transfers between Rainbow Beach & Gympie to meet the GBR or Fraser Island Bus the next day. 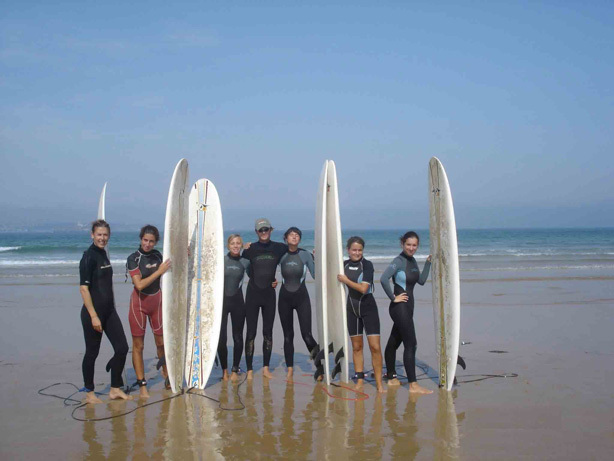 You can also enjoy optional surfing lessons or kayaking with dolphins at Rainbow Beach at great prices. Please ask reception staff for activity options. Please note that activities/accommodation at Rainbow Beach is not operated by Sunset Safaris, and the Sunset Safaris tour guides do not accompany you on this part of your package tour. The Itinerary may be swapped to suit tidal and weather conditions. Transfer between Puma Roadhouse and Rainbow Beach are provided by Premier Motor Service, and all tickets, maps and detailed instructions are included as part of your package for a stress free transfer. Rainbow Beach is a great place to enjoy the afternoon on day 2, (or Morning on Day 4 if doing GBR Tour First). The Rainbow Beach surf and sand is perfect for a swim or surf, and the coloured sands of the Rainbow Beach foreshore are truly spectacular. Lunch, breakfast and dinner are not included while at Rainbow Beach. Our 3-Day Great Barrier Reef tours are designed for singles, couples, backpackers & groups. Sunset Safaris offers the most cost effective & value packed Great Barrier Reef tour in Australia including the Whale Watching (in season only). FREE Animal Zoo entry to hand feed Kangaroos, cuddle a Koala, hold a Crocodile, watch Croc Feeding, hand feed Kangaroos, & see the world’s most venomous snake show. FREE Access to Mon Repos - see turtles laying eggs at night on the beach, & baby turtles hatching (in season only). See Mon Repos Turtle Conservation Centre all year round. Enjoy an Awesome road trip seeing beautiful Queensland scenery in our Comfortable coaches equipped with great entertainment systems. Visit an Aussie Zoo & Croc feeding show, cuddle a Koala & much more. Stop at Mamminos to taste Home Made Ice-cream & Farm Fresh Sugar Cane (in season). Check into resort & enjoy beautiful resort facilities with comfortable ECO Villas. Swim on spectacular beaches in the land of the turtles (swim between the flags). Enjoy our FREE Guided Snorkel School and Fish Feeding Tour on Day-1. Visit MON REPOS to experience the amazing Turtle Conservation Centre. Enjoy the biggest and most luxurious boat in the region for a full day on the Reef. FREE Whale Watching see the mighty Humpback Whale (whale season only). Optional Scuba diving - best value on the reef (extra cost). See Dolphins surfing on the bow of the boat. Snorkel on the Great Barrier Reef (all quality equipment provided). Glass bottom boat viewing of the reef, fish, coral & turtles. 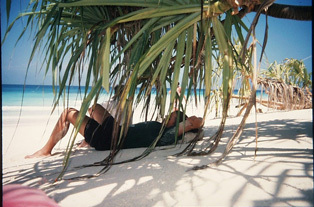 Guided walk on Lady Musgrave Island - a true coral cay. Feed reef fish by the Thousands in crystal clear waters. Spectacular scenery of Lady Musgrave Island and Lagoon. Beachside resort accommodation & linen all included. All meals provided while on tour, including a traditional Aussie BBQ. Fully guided with our professional Tour Guides (no worries mate). See the beautiful Queensland scenery in our comfortable coaches equipped with great entertainment systems. 5:45 am “Mantra on View Hotel” 22 View Ave Surfers Paradise. Lake Birrabeen is one of 4 spectacular Blue Lakes found on Fraser Island. With snow white sandy beaches and crystal clear blue fresh water, set in the middle of beautiful rainforest, Lake Birrabeen is a tour highlight on Fraser Island. Less well known and harder to access than Lake McKenzie, Lake Birrabeen is the largest of the Blue Lakes, and considered by locals and those in the know as the most beautiful lake on Fraser Island. Indian Head on the Northern end of 75 Mile Beach is a spectacular Rocky Headland famous for never-ending views along the eastern beaches and out to sea. Here we see marine life on display, as Dolphins, Turtles, Sharks, Fish and migrating Humpback Whales gather around Indian Head in full view for us to enjoy. Eli Creek is the Largest fresh water stream flowing out to sea on the Eastern side of Fraser Island. Enjoy a refreshing dip in the cool sand filtered water as it flows between the sand dunes and out onto the beach. A board walk is built along the banks of the creek for those who want to just take pictures. One of the worlds most photographed shipwrecks, the SS Maheno on 75 Mile Beach stands as a beautiful contrast between a pristine beach and a man made structure. Learn about the terrible night when the SS Maheno found itself beached on Fraser Island during a cyclone off the Fraser Coast in 1935. The ONLY place in the world to grow rainforest in sand, Fraser Island’s World Heritage Listed Rainforests are truly special. Enjoy the beautifully unique “Pile Valley “ Rainforest walk, as you discover Central Station, Woongoolba Creek and Giant Satiney Trees. The stunning coloured sands are a photographic masterpiece. See the myriad of colours on display, as natural leaching of oxides and vegetable matter stain the each grain of sand over thousands of years. Enjoy snorkeling on the world largest reef. See fish and coral seen nowhere else in the world. Snorkel the famous “Turtle Cleaning Station,” and enjoy watching Turtles being cleaned by small fish. Get off the boat and on land to experience the wonders of a coral cay Island in the South Pacific. See this untouched Island on your guided walk, and learn about the wildlife and unique features of this coral Island. Take a ride with your experienced guides to see the underwater beauty without getting your face wet. See turtles, coral, fish and much more in comfort and style. Only Sunset Safaris offers the Mon Repos LIVE Turtle Encounter on the Great Barrier Reef. See wild turtles crawl up the beach at night to lay eggs and see baby turtles hatch and scurry down the beach. Between April & October, visit the Mon Repos Turtle Centre to learn all about the endangered Loggerhead Turtle and the Mon Repos conservation efforts. 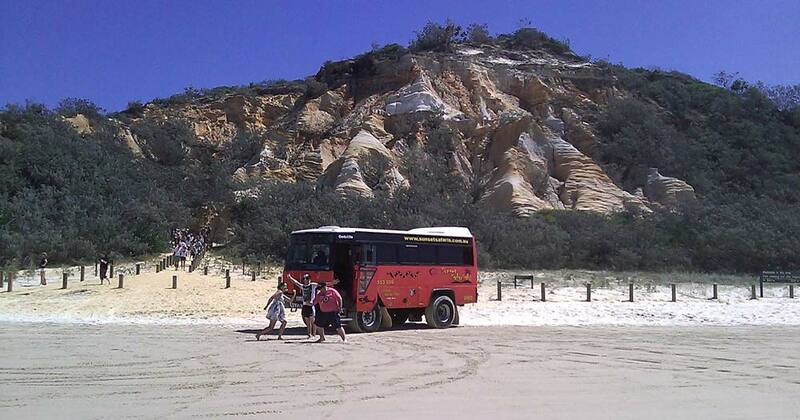 Sunset Safaris provides the very best possible Accommodation to suit your budget while on Fraser Island. Eurong Beach Resort has long been established as being the number 1 resort on the eastern beach thanks to its fantastic facilities and premier beachfront location. Eurong offers full access to all of the facilities, including 2 swimming pools, tennis court, convenience store, bakery, pizzeria, resort restaurant, the famous beach bar, and full beach frontage for that moonlit walk. Sunset Safaris offers you a FREE upgrade from Eurong Beach Resort's Backpacker units, to the very nice MOTEL Quad share units at no extra cost! The Eurong Beach Resort Korrawinga units are recently refurbished and modern, with ensuite, and right next to the resort restaurant and main pool. Live it up in style, with Sunset Safaris. Sunset Safaris offers you two choices of Twin Share and Triple Share upgrades. Motel Accommodation, Queen Bed and Single bed with kitchenette and ensuite. HOTEL Accommodation, Queen Bed and Single bed with kitchenette, TV, Phone and ensuite. The Sunset Safaris 5 Day Package tour offers fantastic value, with a 1 Night stay at a Rainbow Beach backpackers, (or motel if in twin share) and Transfers between Rainbow Beach & Gympie to meet GBR or Fraser Bus the next day. 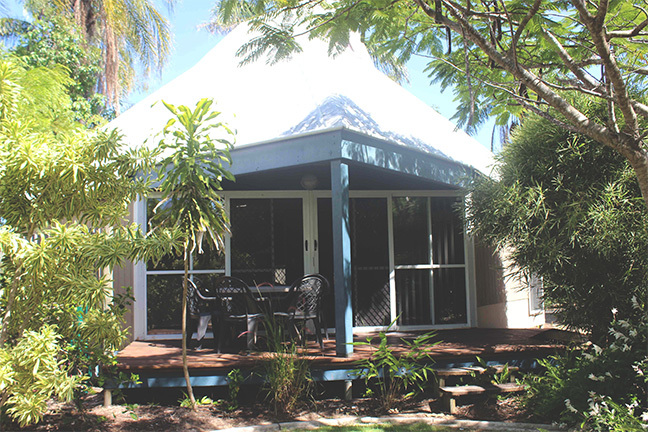 Dingos Backpackers offer comfortable 4 - 8 share accommodation with Free Breakfast. This is included in your standard price. Optional Twin Share upgrade or Family 2-Bedroom apartments are available. Breakfast not included here. Our resort accommodation is right beside Kellys Beach with swimming pools, restaurant, bar, & easy beach access for that moonlit walk. We offer comfortable accommodation to suit your budget & lifestyle with 4 - 6 bed Multi-share ECO Villa accommodation, including single beds in the loft, or Queen & single beds on the ground floor. Choose a Villa for yourself, or save money & share with others from the tour. All ECO Villas have lounge room, Bathroom, Toilet, air-conditioning & Balcony with outdoor setting. Enjoy the spacious gardens, lakes & entertainment areas in this beautiful ECO resort. Tennis, pool-table, air-hockey & other games also available. accomodation(suit family of up to 6)are available (POA). Please contact us directly for Family Apartment Rates. The $245 National Park, Boat Access and Reef Tax to be paid in Cash to Driver upon departure. The best value diving on the Great Barrier Reef with true professionals, and a guaranteed experience you will never forget. Both certified and beginner diving available at great prices. Enjoy our FREE Snorkel School & Fish Feeding in the shallow waters of Bundaberg. 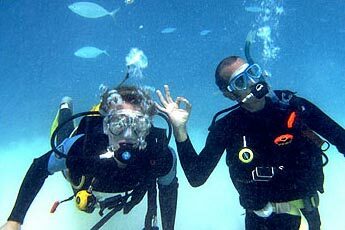 Perfect for beginners to learn before going out on the Reef the next day, & loads of fun for the experienced snorkeler. Sunset Safaris makes every effort to include ALL activities and destinations listed. However due to the extreme nature of Fraser Island, Rainbow Beach, and the Agnes Water Coastline, and weather unpredictability in general, some activities are subject to Tide, Time, and Weather factors, and Sunset Safaris cannot be held liable due to these factors. PAYMENT Your Tour payment is broken up into 2 components, your Sunset Safaris ticket price component. 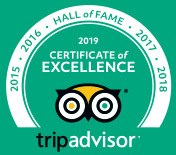 and your Fraser Island - National Park Fees, and Boat Access & Reef Tax component ($60.00 Fraser Island National Park Fees and $210.00 Great Barrier Reef Boat and Reef Fees = Total of $270). They must be paid in CASH to driver upon departure. All prices are subject to change without notice & at the discretion of Sunset Safaris. 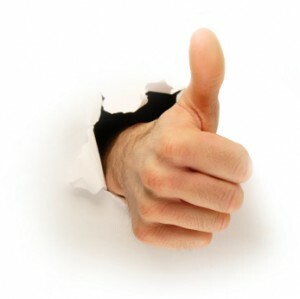 All information stated in this publication is true & correct at the time of publication. Due to traffic, & the extreme conditions experienced on Fraser Island to buses & the environment, Sunset Safaris reserves the right to alter or cancel any section of the itinerary which may result from road, traffic, weather, mechanical, or any other condition or failure or delay of an operational nature without penalty, & such conditions will be considered as a Force Majeure Event. Sunset Safaris will take all reasonable steps to rectify the situation during any such event, however no liability will be accepted by Sunset Safaris in circumstances outside of Sunset Safaris control. No responsibility or liability will be taken in the event of injury from pre-existing medical conditions (eg: bad back), accident, injury, loss or damage to persons or property due to persons own negligence. These booking conditions do not waive Sunset Safaris from any of its obligations according to law. Minimum booking numbers & cancellation fees apply. In continuing to book using this brochure as a guide, you hereby indicate that you understand & agree to these conditions, & agree not to hold Sunset Safaris liable in such circumstances, & agree to the inherent risks associated with traffic, & the wild Fraser Island environment affecting buses & itinerary. All prices are subject to change without notice & at the discretion of Sunset Safaris. All information stated in this publication is true & correct at the time of publication. Due to traffic, & the extreme conditions experienced on the Great Barrier Reef & ocean, Sunset Safaris reserves the right to alter or cancel any section of the itinerary which may result from road, traffic, weather, mechanical, or any other condition or failure or delay of an operational nature without penalty, & such conditions will be considered a Force Majeure Event. Sunset Safaris will take all reasonable steps to rectify the situation during any such event, however no liability will be accepted by Sunset Safaris in circumstances outside of Sunset Safaris control. No responsibility or liability will be taken in the event of injury from pre-existing medical conditions (eg: bad back), accident, injury, loss or damage to persons or property due to persons own negligence. These booking conditions do not waive Sunset Safaris from any of its obligations according to law. Minimum booking numbers & customer cancellation fees apply. In continuing to book using this brochure as a guide, you hereby indicate that you understand & agree to these conditions, & agree not to hold Sunset Safaris liable in such circumstances, & agree to the inherent risks associated with traffic, weather & reef environment affecting boats & itinerary. ONLY SUNSET SAFARIS gives you this HUGE amount of FREE extras whenever you buy a package tour. Enjoy the FREE Cooloola Tour on the way to Fraser Island, and the FREE Sunset Tour while on the Barrier Reef. Cooloola National Park is right on the doorstep of Fraser Island, offering visitors travelling to Fraser Island an AWESOME alternative to the dull and boring highway route to Fraser Island. ONLY Sunset Safaris offers you a FREE TOUR through the beautiful Cooloola National Park. This FREE TOUR replaces almost 2-hours of road travel to or from Fraser Island, allowing YOU to enjoy MORE ACTION than any other company can offer. On your FREE COOLOOLA TOUR, you will enjoy some of the most spectacular scenery that nature has to offer, including:Noosa North Shore - where you can get up close and personal with wild Kangaroos. 4WD the length of this sandy beach for over 40 miles, with pristine Pacific Ocean coastline and steep sand mountain cliffs lining the foreshore. with it's amazing Red Coloured Sands and rugged weathered formations. See the amazing contrast of colours that nature has on offer. 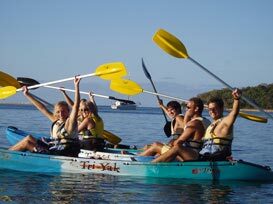 Sunset Safaris makes every effort to include ALL activities and destinations listed. However due to the extreme nature of Fraser Island and the Great Barrier Reef, and weather unpredictability in general, some activities are subject to Tide, Time, off road conditions and Weather factors, and Sunset Safaris cannot be held liable due to these factors. Due to the extreme Off Road conditions on Fraser Island, it should be noted that the Itinerary can occasionally be affected due to cases of tidal issues, mechanical issues and other operational issue unique to Fraser Island. It should also be noted that the Itinerary can occasionally be affected due to cases of tidal issues and other operational issue unique to the Great Barrier Reef such as Ocean conditions, and while every effort and care is taken, Sunset Safaris takes no responsibility for such factors affecting tour activities. We do not encourage customers to rely heavily on return times due to traffic and the factors mentioned above, and Sunset Safaris takes no responsibility for the missing of flights and bus connections if customers choose to book connections and flights close to the normal return times. By continuing to proceed with making a booking on this website, you indicate that you agree to not hold Sunset Safaris responsible due to the above conditions should they occur, and that you accept the inherent risk of these operational anomalies as outlined above.